Epiphany is the climax of the Advent/Christmas Season and the Twelve Days of Christmas, which are usually counted from the evening of December 25th until the morning of January 6th, which is the Twelfth Day. In following this older custom of counting the days beginning at sundown, the evening of January 5th is the Twelfth Night. This is an occasion for feasting in some cultures, including the baking of a special King's Cake as part of the festivities of Epiphany (a King's Cake is part of the observance of Mardi Gras in French Catholic culture of the Southern USA). In some church traditions, only the full days are counted so that January 5th is the Eleventh Day of Christmas, January 6th is the Twelfth Day, and the evening of January 6th is counted as the Twelfth Night. In traditional Christian churches Christmas, as well as Easter, is celebrated as a period of time, a season of the church year, rather than just a day. The Season of the Church Year associated with Christmas actually begins with the first Sunday of Advent, four Sundays before Christmas Day. Advent is marked by expectation and anticipation in preparing to celebrate the coming of Jesus. Christmas begins with Christmas Day December 25 and lasts for Twelve Days until Epiphany, January 6, which looks ahead to the mission of the church to the world in light of the Nativity. The one or two Sundays between Christmas Day and Epiphany are sometimes called Christmastide. For many Protestant church traditions, the season of Epiphany extends from January 6th until Ash Wednesday, which begins the season of Lent leading to Easter. Depending on the timing of Easter, this longer period of Epiphany includes from four to nine Sundays. Other traditions, especially the Roman Catholic tradition, observe Epiphany as a single day, with the Sundays following Epiphany counted as Ordinary Time. In some western traditions, the last Sunday of Epiphany is celebrated as Transfiguration Sunday. The term epiphany means "to show" or "to make known" or even "to reveal." In Western churches, it remembers the coming of the wise men bringing gifts to visit the Christ child, who by so doing "reveal" Jesus to the world as Lord and King. In some Central and South American countries influenced by Catholic tradition, Three Kings’ Day, or the night before, is the time for opening Christmas presents. In some eastern churches, Epiphany or the Theophany commemorates Jesus’ baptism, with the visit of the Magi linked to Christmas. In some churches the day is celebrated as Christmas, with Epiphany/Theophany occurring on January 19th. The colors of Epiphany are usually the colors of Christmas, white and gold, the colors of celebration, newness, and hope that mark the most sacred days of the church year. In traditions that only observe a single day for Epiphany, the colors are often changed after Epiphany to the colors of Ordinary Time, usually green or thematic sanctuary colors, until Transfiguration Sunday, the last Sunday before the beginning of Lent. The colors for Transfiguration Sunday are usually the colors of Holy Days, white and gold. The traditional liturgical symbols of Epiphany are usually associated with the Magi. The symbols include either three crowns or a single crown, various portrayals of the Magi or Wise Men, three gifts, a five pointed star, or a combination of a star and crown. A more modern symbol of Epiphany is a globe or a stylized portrayal of the world. Around January 6, the symbol +C+M+B+ with two numbers before and two numbers after (for example, 20+C+M+B+18) is sometimes seen written in chalk above the doorway of Christian homes. The letters are the initials of the traditional names of the Three Magi: Caspar, Melchior, and Balthasar. These letters also abbreviate the Latin phrase Christus mansionem benedicat, "May Christ bless the house." The beginning and ending numbers are the year, 2018 in the example above. The crosses represent Christ. Marking the lintels of doorways is an old European practice that originally had overtones of magic (protection of the house). However, the symbols are now used throughout the world and usually represent a traditional Epiphany prayer and blessing. Leader: Peace be with this house and with all who live here. Response (All): And peace be with all who enter here. Leader: During these days of the Christmas season, we keep this Feast of Epiphany, celebrating the manifestation of Christ to the Magi, and thereby to the whole world. Today, Christ is manifest to us! Today this home is a holy place because of the presence of Christ here. Leader: Listen to the Gospel according to Matthew. 2:1 In the time of King Herod, after Jesus was born in Bethlehem of Judea, wise men from the East came to Jerusalem, 2:2 asking, "Where is the child who has been born king of the Jews? For we observed his star at its rising, and have come to pay him homage." 2:3 When King Herod heard this, he was frightened, and all Jerusalem with him; 2:4 and calling together all the chief priests and scribes of the people, he inquired of them where the Messiah was to be born. 2:5 They told him, "In Bethlehem of Judea; for so it has been written by the prophet: 2:6 'And you, Bethlehem, in the land of Judah, are by no means least among the rulers of Judah; for from you shall come a ruler who is to shepherd my people Israel.'" 2:7 Then Herod secretly called for the wise men and learned from them the exact time when the star had appeared. 2:8 Then he sent them to Bethlehem, saying, "Go and search diligently for the child; and when you have found him, bring me word so that I may also go and pay him homage." 2:9 When they had heard the king, they set out; and there, ahead of them, went the star that they had seen at its rising, until it stopped over the place where the child was. 2:10 When they saw that the star had stopped, they were overwhelmed with joy. 2:11 On entering the house, they saw the child with Mary his mother; and they knelt down and paid him homage. Then, opening their treasure chests, they offered him gifts of gold, frankincense, and myrrh. 2:12 And having been warned in a dream not to return to Herod, they left for their own country by another road. Leader: This is the word of the Lord to you. Response (All): Thanks be to God! Leader: O God, Lord of all that exists, you revealed your only-begotten Son to every nation by the guidance of a star. Bless this house and all who inhabit it. Fill each of us with the light of Christ, that our concern for others may reflect your love. We ask this through Christ our Lord. As with most aspects of the Christian liturgical calendar, Epiphany has theological significance as a teaching tool in the church. 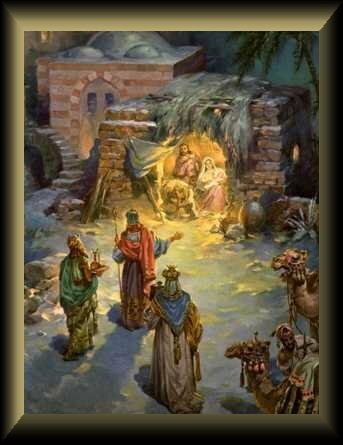 The Wise Men or Magi who brought gifts to the child Jesus were the first Gentiles to acknowledge Jesus as "King" and so were the first to "show" or "reveal" Jesus to a wider world as the incarnate Christ. This act of worship by the Magi, which corresponded to Simeon’s blessing that this child Jesus would be "a light for revelation to the Gentiles" (Luke 2:32), was one of the first indications that Jesus came for all people, of all nations, of all races, and that the work of God in the world would not be limited to only a few. The day is now observed as a time of focusing on the mission of the church in reaching others by "showing" Jesus as the Savior of all people. It is also a time of focusing on Christian community and fellowship, especially in healing the divisions of prejudice and bigotry that we all too often create between God’s children. We thank you for your love, praise you for your Gift, ask for your continued Presence with us, and bring these petitions in the name of your Son, who has truly revealed your heart. Amen. 1. The differences between Western and Eastern traditions relating to when Christmas and Epiphany are celebrated is a complicated issue that cannot be covered adequately here. It is largely a matter of which calendar is used to calculate dates. Most of the world today uses the Gregorian calendar [external link], introduced in the 16th century as a means to correct a slight inaccuracy in the older Julian calendar. This inaccuracy of about 11 minutes a year resulted in an accumulated "drift" of dates in relation to the solar year. This means that "fixed" solar dates, for example the summer and winter solstice and the spring and autumn equinox, would fall on increasingly earlier dates. Of course this would also apply to religious festivals that fall on fixed dates, such as Christmas on December 25. The Gregorian calendar, which was approved by Pope Gregory XIII in 1582, intended to correct the inaccuracy and stabilize this "drift" of dates. As a result it soon became the standard civil calendar throughout the world. However, the Orthodox and Eastern churches continued to use the older Julian calendar as a religious calendar, which meant that religious holidays fell on different days in the Eastern and Western churches. However in 1923, a synod convened by the Ecumenical Patriarch Meletius IV of Constantinople adopted a Revised Julian Calendar [external link] for the daily feasts of the year. This revised calendar was, for all practical purposes, identical with the Gregorian calendar. This calendar has by now been adopted by the Orthodox Churches of Constantinople, Greece, Cyprus, Romania, Antioch, Poland, Bulgaria, Finland, Estonia and the Orthodox Church of America, as well as by some parishes within the Russian Orthodox church in Western Europe. The churches of Russia, Serbia, Jerusalem, and Georgia, together with the other ancient churches of the East and some conservative groups in Greece, have not adopted it and continue to use the older Julian calendar. All Orthodox churches, however, continue to celebrate Pascha (Easter) following calculations made according to the Julian calendar.